Boyle Heights, Los Angeles, California, U.S.
Antonio Ramón Villaraigosa (pronounced /ˌviː.əraɪˈɡoʊsə/; born January 23, 1953), born Antonio Ramón Villar, Jr., is the 41st and current Mayor of Los Angeles, California, the third Mexican American to have ever held office in the city of Los Angeles and the first in over 130 years. He was elected on May 17, 2005, defeating incumbent mayor James Hahn, and then re-elected for a second term in 2009. Prior to his election as mayor, Villaraigosa was the California State Assemblyman for the 45th District, the Speaker of the California State Assembly, and the Los Angeles City Councilman representing the 14th District. Villaraigosa is barred by term limits from running for a third term in 2013. Before being elected to public office, Villaraigosa was a labor organizer. Villaraigosa served as a national co-chairman of Hillary Rodham Clinton's 2008 presidential campaign and as a member of President Barack Obama's Transition Economic Advisory Board. Born Antonio Villar in the City Terrace neighborhood of Los Angeles County's eastside, Villaraigosa attended both Catholic and public schools. His father abandoned the family when Villaraigosa was 5 years old. At the age of 16, a benign tumor in his spinal column briefly paralyzed him from the waist down, curtailing his ability to play sports. His grades plummeted at Cathedral High School. The next year, he was expelled from the Roman Catholic institution after getting into a fight after a football game. He graduated from Roosevelt High School, and, with the help of his English teacher Herman Katz, went on to attend East Los Angeles College. Villaraigosa eventually transferred to University of California, Los Angeles (UCLA), but he did not graduate by the time that he left in 1975. At UCLA, Villaraigosa was a leader of MEChA. At this time, he went by the name "Tony Villar" but began using his birth name, Antonio, in the 1980s. After UCLA, Villaraigosa attended the People's College of Law (PCL), an unaccredited law school that promotes labor union causes in Los Angeles. Villaraigosa failed the California Bar Exam four times and is not licensed to practice law. After PCL, he became a field representative/organizer with the United Teachers Los Angeles (UTLA). He later served as president of the Los Angeles chapter of the American Civil Liberties Union and the American Federation of Government Employees. He received an honorary Doctor of Humane Letters degree from University of Southern California in May of 2006. In 1990, Villaraigosa was appointed to the Los Angeles Metropolitan Transportation Board and served there until 1994. In 1994, Villaraigosa was elected to the California State Assembly. Within his first term, he was selected to serve as Democratic Assembly Whip and Assembly Majority Leader. In 1998, Villaraigosa was chosen by his colleagues to be the first Speaker of the Assembly from Los Angeles in 25 years. Villaraigosa left the Assembly in 2000 due to term limits. Villaraigosa ran for election as mayor of Los Angeles in the 2001 citywide contest but was defeated by Democrat James Hahn in a run-off election. In 2003, Villaraigosa defeated incumbent Councilman Nick Pacheco to win a seat on the Los Angeles City Council representing the 14th District. 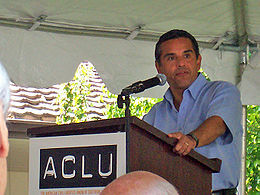 Antonio Villaraigosa speaking at an ACLU event. Villaraigosa placed first in the Los Angeles mayoral election of March 8, 2005, and won the run-off election on May 17, receiving 58.7% of the vote. On July 1, 2005, Villaraigosa was sworn in as the 41st Mayor of Los Angeles. He is the first Latino mayor of Los Angeles since 1872, when Mayor Cristóbal Aguilar (mayor from 1866 to 1868 and again from 1870 until 1872) served as mayor. The swearing in ceremony involved an interfaith prayer service at the Cathedral of Our Lady of the Angels, followed by a large procession to nearby City Hall. On the South Lawn of the facility, he was administered the oath of office by Stephen Reinhardt, judge of the United States Court of Appeals for the Ninth Circuit. The audience of political figurers included Governor Arnold Schwarzenegger, former Governors Gray Davis, Pete Wilson, and Jerry Brown. Also attending were former Vice President Al Gore, U.S. Secretary of State Warren Christopher and New York City Mayor Michael Bloomberg. The Nation attributes Villaraigosa's success in 2005 to his adding a significant number of African Americans to his earlier coalition of "Latinos, labor and white lefties", noting 2005 endorsements by Representative Maxine Waters (a Hahn supporter in 2001), influential resident and basketball star Magic Johnson, and City Council member (and former police chief) Bernard Parks. While a member of the California state assembly, then State Assemblyman Antonio Villaraigosa wrote the first letter to then President Bill Clinton on Carlos Vignali Jr.'s behalf on May 24, 1996, requesting clemency from Vignali Jr.'s drug trafficking conviction for which he had been sentenced to 15 years in federal prison. Released in March 2002 by the congressional Committee on Government Reform, "Justice Undone: Clemency Decisions in the Clinton White House" details Hugh Rodham's involvement in the Vignali, Jr. pardon, when revelations surfaced that then President Clinton granted clemency for Vignali Jr. Rodham, Hillary Clinton's brother, apparently got Vignali, Jr. the pardon after receiving a cash payment. The report takes to task top L.A. elected officials, including then–state Assemblyman Antonio Villaraigosa, county Supervisor Gloria Molina, then–state Senator Richard Polanco and U.S. Representative Xavier Becerra, among others, for lobbying on behalf of Vignali Jr., in light of his drug conviction and the fact that DEA agents long suspected Vignali Sr. to be involved in drug trafficking. During his 2001 mayoral campaign, Villaraigosa expressed regret for writing the letter. "I wrote that letter without talking to prosecutors on the other end," Villaraigosa said in an interview. "I shouldn't have done that." In June 2010, a formal ethics investigation of Villariagosa was launched, due to his unreported acceptance of 81 tickets to concerts, awards ceremonies and sporting events. Estimates - including the 13 Lakers courtside tickets valued at $3,100 each and Academy Awards and Governor’s Ball tickets at $21,000 each - suggest that the value of the tickets could amount to tens of thousands of dollars. Villaraigosa claims that he was performing mayoral duties at these events, but cannot document this. Fox 11 News reports that the Mayor's own calendar calls the games private events. The unreported tickets came to light after the City of Los Angeles paid $3.2 million for Michael Jackson's Memorial, including $2 million in police overtime. Villariagosa commented while on vacation in South Africa that he would not ask AEG, the owner of the Staples Center, to in any way offset the city’s expenses. Later negotiations resulted in a settlement in which Staples Center owners AEG paid $1.3 million and the Jackson Family $1 million. The city revised its estimate of the expenditures to $1.3 million. AEG has lucrative contracts with City Hall, including public subsidies approved by the City Council and endorsed by the mayor. One of Villaraigosa's main transportation-related goals is to extend the Purple Line subway down Wilshire Boulevard to Santa Monica. Proponents have dubbed the project the "Subway to the Sea." Villaraigosa worked to persuade Congressman Waxman to repeal the ban on subway tunneling in Los Angeles, which occurred in 2006. Metro has estimated that it will cost $4.8 billion to complete the subway, at $300 million a mile, and would take approximately 20 years. The Westside Subway Extension project is now being implemented by Metro as a high-priority project. On November 4, 2008, Los Angeles County voters passed Measure R, an additional half-cent per dollar sales tax that increased the city sales tax rate from 9.25% to 9.75% and is projected to generate up to $40 billion over thirty years for transportation, including funding for the "Subway to the Sea." Its passage was credited in large part to Villaraigosa, who lobbied the MTA and County Board of Supervisors to place it on the November ballot, and helped organize the fundraising efforts. Since taking office in 2005, Villaraigosa has increased funding for road repair by 30 percent, which has yielded a 137 percent increase in street maintenance. In three years, the Bureau of Street Services supposedly filled more than one million potholes in Los Angeles. One of Villaraigosa's first executive directives aimed to ban road construction during rush hour in traffic-plagued Los Angeles. Villaraigosa even publicly pledged to take the subway to work one day a month, as reported by The Los Angeles Times. This, however, proved impossible for him. Villaraigosa serves as Chairman of the Los Angeles County Metropolitan Transportation Authority, and oversaw the final approval of the EIR for the proposed Metro Expo Line, the opening of the Orange Line busway through the San Fernando Valley, and the beginning through completion on the Eastside extension of the Metro Gold Line light rail. In February 2010, Villaraigosa traveled to Washington, D.C. in order to promote a "Thirty in Ten" plan that requests an $8.8 billion bridge loan to augment the $5.8 billion expected from Measure R tax revenues. Proceeds would accelerate the construction of 12 mass transit projects. The loan is to be repaid with continuing income from Measure R funds. On Saturday July 18, 2010, the mayor fell from his bicycle after being cut off by a taxi driver. Villaraigosa suffered a broken elbow in the fall, and the taxi driver fled the scene. The accident seems to have converted the mayor into "a new champion of cyclists' rights", when he declared a bicycle safety summit, and announced that he would push for the passage of a "3 foot passing rule" in California. Villaraigosa sought to gain control of the Los Angeles Unified School District (LAUSD) as one of his top priorities as mayor, but failed. In his first State of the City address, he announced his intention to assume full control of the Los Angeles Unified School District, through a bill passed by the State Legislature. The school board and teachers' union immediately protested and support in the community was lukewarm. Consequently, Villaraigosa reached a compromise with leaders of the teachers' unions and state legislators that would create a Council of Mayors of the 28 cities served by LAUSD. The votes of each mayor would be proportionate to the city's population, thus giving Villaraigosa over 80% of the vote, and most often, the final say of what happens, while requiring him to seek consensus from a few other cities. AB 1381 was passed by the state legislature and signed by Governor Arnold Schwarzenegger. The plan received significant opposition among the Los Angeles Board of Education, Board President Marlene Canter, then-superintendent of LAUSD, Roy Romer, among others. On December 21, 2006, AB 1381 was ruled unconstitutional. Villaraigosa made a preliminary appeal that he later dropped. The mayor operates the Partnership for Los Angeles Schools, which controls 10 LAUSD campuses. In June 2009, teachers at 8 of the ten campuses gave the partnership landslide "no confidence" votes. Steve Lopez, a columist at the Los Angeles Times, stated that at the two other schools, a significant number of the teachers disapproved of the partnership's operations. Villaraigosa introduced counter-incentives to keep California film productions at home. Villaraigosa's proposals include eliminating fees for filming done on all city property and reducing business taxes for entertainment-related businesses. Another proposal includes a possible entertainment incentive zone to make it easier to locate film production in the city. Villaraigosa is a member of the Mayors Against Illegal Guns Coalition, an organization formed in 2006 and co-chaired by New York City mayor Michael Bloomberg and Boston mayor Thomas Menino. Villaraigosa has proposed a Homeland Security and Emergency Preparedness initiative, which adds certain units to the Los Angeles Police and Fire Departments and reorganizes some of the current practices. Villaraigosa's latest development in the policy realm of homeland security is the creation of his Homeland Security Advisors, a group of approximately 40 leaders. The panel includes Police Chief William Bratton, former L.A. FBI chief Ron Iden, former Mayor Richard Riordan, Los Angeles County Sheriff Lee Baca and former Dist. Atty. Ira Reiner. It will be co-chaired by his Deputy Mayor for Homeland Security and Public Safety Arif Alikhan. The panel planned for such issues as counter-terrorism measures, evacuation planning and emergency preparedness. Villaraigosa vowed to hire 1,000 new police officers, a promise which has not been kept. On March 6, 2009, Mayor Villaraigosa and Police Chief Bratton announced that the L.A.P.D. had expanded to its largest force in city history. On May 14, 2009, City Council approved an LAPD/LAFD hiring freeze. In a television advertisement paid for by the Villaraigosa campaign, Chief Bratton stated that "Crime is down to levels of the 1950s." Twenty-four hours before the March 3 Election Day, Villaraigosa and Bratton reannounced a statement from the Mayor’s Office that the “citywide crime-rate drop to the lowest level since 1956, the total number of homicides fall[ing] to a 38-year low. Gang homicides were down more than 24 percent in 2008.”  However, former Chief of Police Daryl Gates declared this statistic meaningless, citing the trend toward lengthier prison sentences for career criminals as the true reason for the change. In fact, crime has fallen by 43 percent across California between 1994 and 1999  In an article by Patrick Range McDonald, these statistics were further disputed. The figures are also disputed by Professor Andrew Karmen, John Jay College of Criminal Justice. Karmen stated that, adjusting for population, the Los Angeles murder rate would need to be 180 or less to be equivalent to the crime rate of 1956, with its rate of 104 homicides per 2.2 million people, or one killing for every 22,115 people (the 2007 rate was 396 per 4 million people, or one killing per 10,101 people). McDonald further noted that, "In 1956, 89 percent of homicides were cleared. Today, if you kill another human being in Los Angeles, chances are very good you will get away with it: 43 out of every 100 killers are not caught." Similarly, he notes, "In 1956, 42 percent of robberies were cleared by an arrest. Today, that number is 26 percent." In January 2005, Villaraigosa appeared before a coalition of animal rights activists and pledged that, if elected, he would implement a no-kill policy for Animal Services and fire General Manager Guerdon Stuckey, an appointee of former Mayor Hahn. Animal activists had expressed doubts regarding Stuckey's ability to lead the Department of Animal Service since his appointment, primarily citing his lack of experience. During Stuckey's tenure, activist concern intensified due to a refusal to accept charity-sponsored spay and neuter services, firings of several key animal rights-oriented workers, and excessive euthanasia of animals held by Animal Services. Approximately one year after Villaraigosa's initial promise to fire Stuckey and susbtantial negative press, Villaraigosa fired Stuckey. Stuckey appealed the firing to the City Council and threatened a lawsuit, and in February 2006, the Los Angeles City Council awarded Stuckey a $50,000 consulting fee with the agreement that there would be no lawsuit. Stuckey supporters alleged the animal activists would be disappointed with any manager of the Department of Animal services, and objected to tactics employed by some of the more radical activists, which included smoke bombs and picketing. In January 2006, Villaraigosa appointed Ed Boks to the General Manager position. In April 2009, General Manager Ed Boks was forced to resign after City Council demanded that he be fired because of poor performance. Legal scandals may have played a part in their decision, in April 2009, a New York City judge ruled that Ed Boks had racially discriminated against an African American man whom he fired when he was the General Manager of New York City Animal Care and Control, replacing the fired worker with a personal friend, and in May 2009, the Los Angeles City Council authorized a payout of $130,000 in order to settle a sexual harassment claim filed against Boks and the City by a female shelter employee. In June 2010, fifteen months after Boks’ resignation, Brenda Barnette, former CEO of the Seattle Humane Society was appointed. Villaraigosa has tripled the city's trash collection fee from $11 per month to $36.32 per month for single-family homes, stating, "Every new dollar residents pay for trash pickup will be used to put more officers on the streets," in a press release dated April 12, 2006. A 2008 L.A. City Contoller audit by Laura Chick determined that 2008 "only $47 million, or about one-third of the new trash-fee revenue then pouring into city coffers, went to hiring cops, and 366 officers were hired instead of the promised 1,000." Villariagosa then lobbied to place Proposition S on the ballot to fund new police officers, concerned that a pending court ruling could eliminate the 40-year-old 10% telephone tax. This generated some controversy among tax activists, as the mayor and his negotiating team had recently reached a salary agreement resulting in a 23% pay hike. Controller Laura Chick noted that Proposition S language does not restrict expenditure to police and firefighters, and instead deposits the money into the general fund. It is not certain that any of the Prop S monies were used to hire new police officers. Villaraigosa supports Proposition O, which currently adds $10.22 to the property tax bill of a $350,000 home and will eventually climb to $35.00. The mayor also campaigned last fall for two education bond measures that will increase the size of property tax bills over the next decade. On March 23, 2010, Villaraigosa in a leaked memo, warned the Los Angeles City Council that their potential failure to support a series of four proposed rate increases totaling 37% and already approved by the city's Department of Water and Power would be "the most immediate and direct route to bankruptcy the city could pursue". In April 2008, Villaraigosa set aside a large parcel of industrial land around the Los Angeles River to create a “clean-technology corridor.” Discussions have started with international companies about relocating to the corridor and a range of incentives are available for businesses opting to move to the city. The site will include a research facility that will draw on the engineering talents of local higher-education institutions, such as the California Institute of Technology and UCLA. About 20 acres (81,000 m2) has also been set aside for a manufacturing center. As of August 2010, the project is still in the planning stage. Villaraigosa also made Million Trees LA one of his campaign promises, pledging to plant one million new trees in parks, public property, and communities such as schools. On August 10, 2007, The Los Angeles Times published an expose on water use by Villaraigosa at his private residences. During the Summer of 2007, Villaraigosa challenged Los Angeles residents to slash their water use by 10% in the face of an historic drought. "Los Angeles needs to change course and conserve water to steer clear of this perfect storm," Villaraigosa said then. But DWP records obtained by the Los Angeles Times show that "Villaraigosa has been contributing to that storm," according to the Times. He and his family used 386,716 gallons of water at their Mount Washington home, far higher than the average of 209,000 gallons. Villaraigosa blamed his high water use on "gophers that chewed holes through a rubberized drip-irrigation system." In October 2006, Villaraigosa traveled to England for several days and Asia for a sixteen-day trade mission. In England, he visited London and Manchester, at the invitation of Prime Minister Tony Blair, and spoke about Los Angeles' efforts regarding global warming, homeland security and emergency preparedness, and its bid for the 2016 Olympic Games. Prime Minister Blair had visited Mayor Villaraigosa a couple months prior to that in Los Angeles. In 2006, Mayor Villaraigosa led a delegation of over 50 business leaders to China, South Korea, and Japan that secured $300 million in direct foreign investment. In Beijing, the Mayor opened a LA Inc. tourism office, in order to ensure a permanent welcome for the millions of Chinese tourists who will visit Los Angeles over the next decade. In Japan, Villaraigosa launched a See My LA advertising campaign in Tokyo-based Family Mart convenience stores throughout Japan, South Korea, Taiwan, and Thailand. In February 2008, the mayor welcomed Mexican President Felipe Calderón Hinojosa and members of the Mexican delegation to discuss trade opportunities and witness the signing of a Memorandum of Understanding (MOU) between the Mexico Business Council for Foreign Trade, Investment and Technology (COMCE) and the Los Angeles Area Chamber of Commerce. Villaraigosa traveled to Israel in June 2008 to meet with Israeli experts in homeland security, counter-terrorism, and green technology. He also signed an agreement with the International Institute for Counter-Terrorism (ICT - part the Interdisciplinary Center in Herzliya) on behalf of the LA police department. Under the agreement, the ICT will train US homeland security officials. In recent years, he developed a relationship with the mayor of the Israeli city of Sderot, Eli Moyal, and met with him during the visit. Villaraigosa has long retained strong ties to the Los Angeles Jewish Community, having spent part of his childhood in the once-Jewish dominated neighborhood of Boyle Heights. After his election as Mayor, Villaraigosa was featured on the cover of Newsweek, and in Time 's story on the country's 25 most influential Latinos, but repeated questions concerning his marital infidelity issues appear to have damaged his reputation locally and nationally. Mayor Antonio Villaraigosa topped a list of all-time worst Angelenos chosen by online voters who responded to the Talk Back to Lopez poll at the Los Angeles Times. Villaraigosa has also received criticism because of his membership in MEChA while attending UCLA and his alleged support for immigration reform. He has also been criticized because of the high frequency in which he holds press conferences, attends photo-ops, and travels out-of-town (including campaigning for Hillary Clinton). An LA Weekly article by Patrick Range McDonald published on September 11, 2008, presented an analysis of a 10-week period from May 21 to August 1, and determined that "On direct city business—such as signing legislation and meeting with city-department heads—his schedule shows the mayor spent 11 percent of his time...Yet the 11 percent of Villaraigosa's time that the Weekly has identified as being spent in L.A. on actual city work—running, fixing or shaping government policies and actions—reveals that he frequently spends that limited time huddling with special-interest groups who have helped him attain higher office." A November 4, 2008 election day poll conducted by the Leavey Center for the Study of Los Angeles at Loyola Marymount University found that Villaraigosa had a job approval rating of 61%. In 2009, a poll by the Los Angeles times showed his approval rating had slipped to 55%, "relatively low for a sitting mayor who faced little name opposition in his recent re-election victory." At the same time, his showing and that of the candidates he supported in the election were lackluster. On May 6, 2006, Villaraigosa was awarded an honorary degree by Loyola Marymount University (LMU), and was the Class of 2006 Commencement Speaker. On May 12, 2006, he was awarded a Doctor of Humane Letters by the University of Southern California (USC) and was the Class of 2006 commencement speaker. Political experts questioned Villaraigosa's future in state and national politics after his relatively poor performance in the 2009 election. Villaraigosa received only 55.65% of the vote, a relatively small majority, despite running against a field of nine relative unknowns and spending 15 times as much money as his most prominent challenger, attorney Walter Moore who won 26.23% after previously only winning 2.5% of the vote in the 2005 election. Villaraigosa also drew controversy by refusing to debate any of his opponents before the election, namely Walter Moore. One columnist summarized Villaraigosa's poor showing as follows: "Villaraigosa stepped into the batter's box on Tuesday, swung and missed twice, and legged out a weak infield hit.". In 2009 the Los Angeles Times published an investigative report questioning the assignment of high-paying government jobs to those with close family or other personal connections to those in political power, pointing out that California taxpayers pay Marisela Villar, daughter of Villaraigosa, $68,000 for work as a "field representative" answering constituent calls and arranging community meetings. Ms. Villar reportedly has no degrees or other particular qualifications for the position, to which she was appointed by close political allies of her father. "It looks like nepotism," said Tracy Westen, chief executive of the Center for Governmental Studies in Los Angeles. "It's the kind of thing the public doesn't like: people using their power and influence to provide cushy jobs to friends and family.". Controversy arose in response to the sudden withdrawal of Ricardo Lara and Arturo Chavez from the 2008 46th District election, which is alleged to have occurred after the two attended a secret meeting at the Getty House with Villaraigosa and his cousin, John Pérez, who had recently announced his candidacy for the seat. The departure of these two serious challengers cleared the field for John Pérez to win the seat. Within months, Villaraigosa appointed Lara to the Los Angeles City Planning Commission. Lara later gained criticism for concurrently serving on the Planning Commission board (restricted to residents of Los Angeles) and running for state Assembly in the 50th District (restricted to residents of the 50th District). No part of the City of Los Angeles is included in the 50th District. Following the Los Angeles Times article, "Legislative aide Ricardo Lara accused of straddling communities," Lara resigned from the Planning Commission. At age 21, Villaraigosa fathered the first of his first four children, Marisela Villar, after having been involved with the mother for only six weeks. At age 25, his second daughter, Prisila Villar-Contreras, was born to another woman. At age 34, as Antonio Villar, he married Corina Raigosa November 28, 1987, and adopted a combination of their last names as his family name. The couple had two children, Natalia and Antonio Jr. In the wake of extensive media coverage of his alleged affair with Spanish-language television reporter, Mirthala Salinas, Villaraigosa announced that he was separating from his wife, and on June 12, 2007, Corina Villaraigosa filed for dissolution of marriage in Los Angeles Superior Court, citing irreconcilable differences. Villaraigosa acknowledged on July 3, 2007, that he was in a relationship with Salinas. As a result of the affair, Salinas was suspended by her employer, Telemundo, forcibly relocated to Riverside, after which she resigned. In a New Yorker profile published shortly before the divorce, Villaraigosa acknowledged that he and Corina had had difficulties over the course of their marriage. “In a twenty-year marriage, there are many ups and downs," Villaraigosa said." The New Yorker also reported that in 1994, while Corina was undergoing treatment for thyroid cancer, Villaraigosa was involved with a friend's wife and Corina filed for dissolution of marriage at that time. The couple reconciled two years later. The New Yorker magazine reported that Villaraigosa's actions had infuriated colleagues who had helped portray him as a family man and lost him key supporters. Villaraigosa has a relationship with Lu Parker, a local television news anchor and 1994 Miss USA, from March 2009. Villaraigosa is 17 years her senior . ^ Scott Martelle Contributor. "Los Angeles Mayor Antonio Villaraigosa Faces Ethics Review Over Free Tickets". Aolnews.com. http://www.aolnews.com/nation/article/los-angeles-mayor-antonio-villaraigosa-faces-ethics-review-over-free-tickets/19500262. Retrieved 2010-08-03. ^ "Some Of Mayor Villaraigosa's Prime Lakers Tickets Are Gifts From Staples Center Owner - Los Angeles News - The Informer". Blogs.laweekly.com. 2010-05-28. http://blogs.laweekly.com/informer/city-news/villaraigosa-lakers-tickets-ae/. Retrieved 2010-08-03. ^ "Villaraigosa Free Tickets Scandal". News.lalate.com. 2010-06-12. http://news.lalate.com/2010/06/12/villaraigosa-free-tickets-scandal/. Retrieved 2010-08-03. ^ a b Romero, Dennis (2010-06-23). "Mayor Villaraigosa Doesn't Seem To Treat His Free-Ticket Outings As 'Official Events' - Los Angeles News - The Informer". Blogs.laweekly.com. http://blogs.laweekly.com/informer/politics/villaraigosa-tickets-scandal/. Retrieved 2010-08-03. ^ "Villaraigosa says only L.A. should pay Jackson memorial costs, slams city aides' website appeal for donations | L.A. NOW | Los Angeles Times". Latimesblogs.latimes.com. 2009-07-13. http://latimesblogs.latimes.com/lanow/2009/07/villaraigosa-says-only-la-should-pay-jackson-memorial-costs-slams-city-aides-for-website-appeal-for-.html. Retrieved 2010-08-03. ^ "Jackson Memorial to Cost Los Angeles How Much - FOX 11 News". myFOXla.com. 2010-06-21. http://www.myfoxla.com/dpp/news/politics/Jackson_Memorial_Costs_20090706. Retrieved 2010-08-03. ^ "Staples Center's Parent To Kick In $1.3 Million For Jackson Memorial - Los Angeles News - The Informer". Blogs.laweekly.com. 2010-06-18. http://blogs.laweekly.com/informer/city-news/aeg-staples-jackson-memorial/. Retrieved 2010-08-03. ^ Metro (LACMTA). "Westside Subway Extension (project website)". http://www.metro.net/projects/westside/. Retrieved 2010-08-30. ^ Yonah Freemark March 1st, 2010 (2010-03-01). "How Feasible is Antonio Villaraigosa’s 30/10 Gambit for Los Angeles Transit? « The Transport Politic". Thetransportpolitic.com. http://www.thetransportpolitic.com/2010/03/01/how-feasible-is-antonio-villaraigosas-3010-gambit-for-los-angeles-transit/. Retrieved 2010-08-03. ^ Dennis Romero. "Mayor Antonio Villaraigosa Breaks Elbow In Bicycle Accident". http://blogs.laweekly.com/informer/city-news/villaraigosa-bicycle-accident/. Retrieved 2010-09-02. ^ Daisy Nguyen. "Villaraigosa Bicycle Summit: Fall From Bike Spins LA Mayor Into Cycle Advocate". http://www.huffingtonpost.com/2010/08/16/villaraigosa-bicycle-summ_n_683357.html. Retrieved 2010-09-02. ^ LAVoice.org (2006-12-21). "Judge Slaps Down Antonio: AB 1381 Unconstitutional :: LAVoice.org :: LOS ANGELES SPEAKS HERE :: A public-access blog". Lavoice1.org. http://lavoice1.org/article2494.html. Retrieved 2010-08-03. ^ Lopez, Steve. "L.A's mayor getting schooled." Los Angeles Times. June 24, 2009. Retrieved on June 24, 2009. ^ "Mayor Villaraigosa proposes to merge LAPD with city's public safety workers". CAIVN. 2010-04-21. http://www.caivn.org/article/2010/04/21/mayor-villaraigosa-proposes-merge-lapd-citys-public-safety-workers?quicktabs_3=0. Retrieved 2010-08-03. ^ "LAPPL - Los Angeles Police Protective League: Bratton: L.A. Is as Safe as 1956". Lapd.com. http://lapd.com/news/headlines/bratton_la_is_as_safe_as_1956/. Retrieved 2010-08-03. ^ "A Primer: Three Strikes: The Impact After More Than a Decade". Lao.ca.gov. 1996-06-20. http://www.lao.ca.gov/2005/3_Strikes/3_strikes_102005.htm. Retrieved 2010-08-03. ^ Patrick Range McDonald (2009-04-30). "Bratton: L.A. Is as Safe as 1956 - Page 5 - News - Los Angeles". LA Weekly. http://www.laweekly.com/2009-04-30/news/bratton-l-a-is-as-safe-as-1956/5. Retrieved 2010-08-03. ^ "New Animal Services Chief Ok'D Activists Protest Stuckey'S Lack Of Experience. - Free Online Library". Thefreelibrary.com. http://www.thefreelibrary.com/NEW+ANIMAL+SERVICES+CHIEF+OK'D+ACTIVISTS+PROTEST+STUCKEY'S+LACK+OF...-a0124524677. Retrieved 2010-08-03. ^ Stark, Annette (2004-02-24). "Annette Stark LA CityBeat: Welcome to the Jungle Cover Story By Annette Stark". Annette-stark-lacitybeat.blogspot.com. http://annette-stark-lacitybeat.blogspot.com/2009/03/welcome-to-jungle-cover-story-by.html. Retrieved 2010-08-03. ^ "Controversial L.A. Animal Services General Manager Ed Boks resigns". The Los Angeles Times. 2009-04-24. http://latimesblogs.latimes.com/unleashed/2009/04/controversial-la-animal-services-general-manager-ed-boks-resigns.html. Retrieved 2010-08-03. ^ "Villaraigosa nominates outsider to run LA animal services - LA Daily News". Dailynews.com. 2010-06-17. http://www.dailynews.com/news/ci_15321017. Retrieved 2010-08-03. ^ Zahniser, David (2008-07-09). "Trash tax doesn't just hire police - Los Angeles Times". Articles.latimes.com. http://articles.latimes.com/2008/jul/09/local/me-newcops9. Retrieved 2010-08-03. ^ Patrick Range McDonald (2009-10-15). "Long Knives Slice Up Bratton - Page 1 - News - Los Angeles". LA Weekly. http://www.laweekly.com/2009-10-15/news/long-knives-slice-up-bratton/. Retrieved 2010-08-03. ^ a b Zahniser, David (2007-10-17). "Council places phone tax on ballot - Los Angeles Times". Articles.latimes.com. http://articles.latimes.com/2007/oct/17/local/me-phonetax17. Retrieved 2010-08-03. ^ Tibby Rothman (2008-02-07). "Proposition S: City Hall's Black Hole - Page 1 - News - Los Angeles". LA Weekly. http://www.laweekly.com/2008-02-07/news/city-hall-s-black-hole/. Retrieved 2010-08-03. ^ "Villaraigosa warns of bankruptcy if L.A. City Council blocks electricity rate hike | L.A. NOW | Los Angeles Times". Latimesblogs.latimes.com. 2010-03-23. http://latimesblogs.latimes.com/lanow/2010/03/villaraigosa-warns-of-bankruptcy-if-la-council-blocks-power-rate-hike.html. Retrieved 2010-08-03. ^ "Villaraigosa Voted Worst Angeleno Of All Time - Los Angeles News - The Informer". Blogs.laweekly.com. 2010-02-04. http://blogs.laweekly.com/ladaily/city-news/villaraigosa-worst-in-la/. Retrieved 2010-08-03. ^ Garofoli, Joe (2009-06-23). "L.A. mayor Villaraigosa won't run for governor - SFGate". Articles.sfgate.com. http://articles.sfgate.com/2009-06-23/bay-area/17211161_1_villaraigosa-unemployment-rate-los-angeles-mayor. Retrieved 2010-08-03. ^ "La Opinión - noticias locales, nacionales e internacionales desde Los Ángeles - impre.com - Intocable la nómina del alcalde". impre.com. 2010-02-26. http://www.impre.com/laopinion/noticias/2010/2/26/intocable-la-nomina-del-alcald-175247-1.html. Retrieved 2010-08-03. ^ "C-115759 (Contracts)". Cityclerk.lacity.org. http://cityclerk.lacity.org/lacityclerkconnect/index.cfm?fa=ccon.viewrecord&contractnum=C-115759. Retrieved 2010-08-03. ^ Gene Maddaus (2010-06-03). "The Chosen One - Page 1 - News - Los Angeles". LA Weekly. http://www.laweekly.com/2010-06-03/news/the-chosen-one/1. Retrieved 2010-08-03. ^ Gene Maddaus (2010-06-03). "The Chosen One - Page 1 - News - Los Angeles". LA Weekly. http://www.laweekly.com/2010-06-03/news/the-chosen-one/. Retrieved 2010-08-03. ^ Zahniser, David (2009-04-10). "Legislative aide Ricardo Lara accused of straddling communities - Los Angeles Times". Articles.latimes.com. http://articles.latimes.com/2009/apr/10/local/me-lara10. Retrieved 2010-08-03. ^ "Los Angeles". Laweekly.com. 2010-06-03. http://www.laweekly.com/content/printVersion/952053. Retrieved 2010-08-03. ^ Tobar, Hector (2001-03-16). "Intensity Fuels Consensus Builder's Rapid Rise - Page 4 - Los Angeles Times". Articles.latimes.com. http://articles.latimes.com/2001/mar/16/news/mn-38487/4. Retrieved 2010-08-03. ^ Font size Print E-mail Share 34 Comments By Lloyd de Vries (2007-08-03). "L.A. Mayor's Girlfriend Suspended From Job". CBS News. http://www.cbsnews.com/stories/2007/08/03/entertainment/main3130690.shtml. Retrieved 2010-08-03. ^ Helfand, Duke; James, Meg (2007-09-25). "Network reassigns mayor's girlfriend - Los Angeles Times". Articles.latimes.com. http://articles.latimes.com/2007/sep/25/local/me-salinas25. Retrieved 2010-08-03. ^ James, Meg; Helfand, Duke (2007-10-02). "Salinas' tenure with Telemundo is over - Los Angeles Times". Articles.latimes.com. http://articles.latimes.com/2007/oct/02/local/me-salinas2. Retrieved 2010-08-03. Michael A. Fletcher (2008-11-14). "Economic Advisers Represent Wide Range". Washington Post. http://www.washingtonpost.com/wp-dyn/content/story/2008/11/13/ST2008111303997.html. Retrieved 2009-04-26. Bruck, Connie (2007-05-21). "Fault Lines". The New Yorker. http://www.newyorker.com/reporting/2007/05/21/070521fa_fact_bruck?printable=true. Retrieved 2007-07-25. Philip J. LaVelle (2003-08-30). "Bustamante's MEChA past fuel for conservative critics". SignOnSanDiego.com. San Diego Union-Tribune. http://www.signonsandiego.com/news/politics/recall/20030830-9999_1n30mecha.html. Retrieved 2009-04-26. Allan Wall (2001-05-24). "MEChA, Villaraigosa And The LA Mayoral Campaign". Frontpagemag.com. http://www.frontpagemag.com/Articles/ReadArticle.asp?ID=3531. Retrieved 2009-06-03. "Mayor Antonio Villaraigosa's Wife Files For Divorce". KNBC. 2007-06-12. http://www.knbc.com/news/13492008/detail.html?subid=10101581. Retrieved 2007-07-25. Sheri & Bob Stritof (2007-07-26). "Corina Raigosa and Antonio Villaraigosa Marriage Profile". Marriage.about.com. http://marriage.about.com/od/politics/p/villaraigosa.htm. Retrieved 2009-04-26. John North (2007-07-05). "L.A. Mayor Admits to Affair with TV Anchor". Abclocal.go.com. http://abclocal.go.com/kabc/story?section=local&id=5445161. Retrieved 2009-04-26. "L.A. mayor Villaraigosa acknowledges 'relationship' with TV reporter". Associated Press. 2007-07-03. http://www.signonsandiego.com/news/state/20070703-0602-lamayor.html. Retrieved 2009-06-03. "Biography". Mayors Office, City of Los Angeles. http://www.ci.la.ca.us/mayor/mayorsoffice/Biography/index.htm. John Nichols (2005-06-02). "Progressive City Leaders". The Nation. http://www.thenation.com/doc/20050620/nichols2. Retrieved 2009-06-03. "Mayor Villaraigosa's Executive Directives on Ethics". Los Angeles City Ethics Commission. http://ethics.lacity.org/MayorExecDirec.cfm. Retrieved 2009-04-26. Gold, Matea; Stammer, Larry B. (2001-02-13). "2 City Leaders Say They Regret Helping Dealer". Los Angeles Times. http://articles.latimes.com/2001/feb/13/news/mn-24769. Retrieved 2009-04-26. Mcgreevy, Patrick (2007-05-02). "Mayor accused of ethics lapses". Los Angeles Times. http://articles.latimes.com/2007/may/02/local/me-mayor2. Retrieved 2009-04-26. Steve Hymon (2008-12-01). "With ballots all counter, Measure R's victory is complete". Los Angeles Times. http://latimesblogs.latimes.com/bottleneck/2008/12/with-ballots-al.html. Retrieved 2009-04-26. "PAC Leadership Council Meets with LA Mayor Antonio Villaraigosa". DGA Monthly - Volume 3 News Issue 5. Directors Guild Of America. 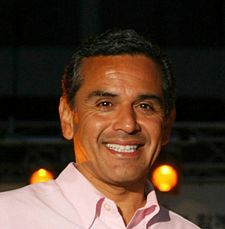 2006-05. http://www.dga.org/news/dgamonthly-0506/news_villaraigosa.php3. Retrieved 2009-06-03. Robert Greene (2005-12-22). "A Billionaire's Bark". LA Weekly. http://www.laweekly.com/2005-12-22/news/a-billionaire-s-bark/. Retrieved 2009-06-03. Carla Hall (2008-08-12). "L.A. Shelter Workers Say Staff Cuts Will Hurt Animal Care". Los Angeles Times. http://www.latimes.com/news/local/la-me-shelter12-2008aug12,0,5481988.story. David Zahniser (2009-04-23). "Villaraigosa backs mail-in ballots on fee increases". Los Angeles Times. http://www.latimes.com/news/local/la-me-fees23-2009apr23,0,4326364.story. Retrieved 2009-04-26. "But what's in the enchilada?". The Economist. 2005-10-27. http://www.economist.com/world/na/displaystory.cfm?story_id=E1_VDRRVJP. Retrieved 2005-07-25. "The mayor takes charge". The Economist. 2006-04-27. http://economist.com/world/na/displaystory.cfm?story_id=E1_GRVJTVP. Retrieved 2005-07-25. "Antonio Villaraigosa: Mayor Sets Agenda for the Nation". Financial Times. 2008-10-27. http://www.ft.com/cms/s/0/906430ac-a3b5-11dd-942c-000077b07658.html. Zach Behrens (2008-09-23). "LA to be Clean Technology Capital?". LAist.com. http://laist.com/2008/09/23/la_clean_technology_capital.php. Retrieved 2009-06-03. Duke Helfand (2006-09-20). "Villaraigosa to Travel to England, Then Visit Asia for a 16-Day Trade Mission". Los Angeles Times. http://www.latimes.com/news/local/la-me-mayor20sep20,1,27571.story. Retrieved 2009-06-03. "Growing A Global Capital". Office Of The Mayor, City Of Los Angeles. http://www.lacity.org/Mayor/villaraigosaplan/EconomicDevelopment/GrowingAGlobalCapital/index.htm. Yaakov Lappin (2008-07-19). "LA mayor 'inspired' by courage of Sderot residents". The Jerusalem Post. http://fr.jpost.com/servlet/Satellite?cid=1213794273249&pagename=JPost/JPArticle/ShowFull. Retrieved 2009-06-03. Ze'ev Trachtman (2008-06-13). "LA mayor to Sderot residents: You are courageous". Yedioth Internet. http://www.ynet.co.il/english/articles/0,7340,L-3555332,00.html. Retrieved 2009-06-03. Rebecca Spence (2008-02-20). "L.A.’s Latino Mayor Welcomed as One of the Tribe". The Jewish Daily Forward. http://www.forward.com/articles/12747/. Retrieved 2009-06-03. "John And Ken Show". Clear Channel, KFI-AM. 2008-12-28. http://a1135.g.akamai.net/f/1135/18227/1h/cchannel.download.akamai.com/18227/podcast/LOSANGELES-CA/KFI-AM/JK1226084P.mp3. Retrieved 2009-04-26. Jill Stewart (2006-04-28). "Catering to the illegal immigrant lobby". San Francisco Chronicle. http://www.sfgate.com/cgi-bin/article.cgi?file=/chronicle/archive/2006/04/28/EDGNSGUCDV1.DTL. Retrieved 2009-06-03. Patrick Range McDonald (2008-09-08). "The All-About-Me Mayor: Antonio Villaraigosa's Frenetic Self-Promotion". Laweekly.com. http://www.laweekly.com/2008-09-11/news/the-all-about-me-mayor. Retrieved 2009-04-26. Michael Higby (2008-12-29). "Antonio Villaraigosa: The Hardest Working Man in Politics? Yea, right". Mayorsam.blogspot.com. http://mayorsam.blogspot.com/2008/12/antonio-villaraigosa-hardest-working.html. Retrieved 2009-04-26. "The Caruso Factor". Laweekly.com. 2008-10-15. http://www.laweekly.com/2009-01-01/news/the-caruso-factor-october-15-2008/. Retrieved 2009-04-26. Kevin Roderick (2008-12-09). "Exit poll good for Villaraigosa". LA Observed. http://www.laobserved.com/archive/2008/12/exit_poll_good_for_villar.php. Retrieved 2009-04-26. Ed Leibowitz (2009-06). "Dear Mr Mayor". Los Angeles Magazine. http://www.lamag.com/article.aspx?id=15528&page=2. Retrieved 2009-06-04. Dreier, Peter (2009-06-10). "Judging Mr. Mayor". Jewish Journal of Greater Los Angeles. http://www.jewishjournal.com/cover_story/article/judging_mr_mayor_20090610/. Retrieved 2009-06-15. "Presented with the Tom Bradley Legacy Achievement Award". Tom Bradley Legacy Foundation at UCLA. 2005-09-25. http://www.tombradleylegacy.org/ezine-feb-2006.html. Retrieved 2009-06-03. "USC Honorary Degrees". Usc.edu. http://www.usc.edu/admin/provostoffice/honorarydegrees/past_recipients.html. Retrieved 2009-04-26. Rick Orlov (2008-12-09). "Survey boosts mayor". Insidesocal.com. http://insidesocal.com/politics/2008/12/survey-boosts-mayor.html. Retrieved 2009-04-26. "West Valley Officer Receives Purple Heart". Daily News (L.A.). 2007-09-25. http://www.thefreelibrary.com/WEST+VALLEY+OFFICER+RECEIVES+PURPLE+HEART.(News)-a0169207310. Retrieved 2009-04-26. "World Mayor 2008 Results". City Mayors. http://www.worldmayor.com/contest_2008/world-mayor-2008-results.html. Steve Lopez (2009-03-04). "Villaraigosa's win might not be a victory". Los Angeles Times. http://www.latimes.com/news/local/la-me-lopezweb-2009mar05,1,2819261.column. Retrieved 2009-04-26. Michael Finnegan (2009-03-23). "In Southland visit, Gavin Newsom touts his centrist positions". Los Angeles Times. http://www.latimes.com/news/local/la-me-newsom23-2009mar23,0,4446216,full.story. Retrieved 2009-04-26. "Political nepotism Alive And Well In Orange County". http://blogs.ocweekly.com. Los Angeles Times. 2009-03-27. http://blogs.ocweekly.com/navelgazing/a-clockwork-orange/political-nepotism-alive-and-w. Retrieved 2009-04-26. "Biography of Antonio Villaraigosa". Los Angeles Almanac. Given Place Media. http://www.laalmanac.com/government/gl12.htm. Retrieved 2009-06-04. Phil Willon (2009-06-02). "L.A. mayor is dating local newscaster". www.latimes.com (Los Angeles Times). http://www.latimes.com/news/local/la-me-villaraigosa2-2009jun02,0,312871.story. Retrieved 2009-06-02. David Zahniser, Maeve Reston (2009-05-20). "Weiss' defeat a stinging blow to City Hall ally Villaraigosa". Los Angeles Times. http://www.latimes.com/news/local/la-me-city21-2009may21,0,7790592.story?track=rss. Retrieved 2009-06-04. Robert Faturechi (2005-07-05). "Villaraigosa sworn in with festivities". UCLA Daily Bruin. http://www.dailybruin.ucla.edu/stories/2005/jul/5/villaraigosa-sworn-in-with-fes/. Retrieved 2009-06-05. "Villaraigosa Sworn in as Los Angeles Mayor". Associated Press. USA Today. 2005-07-01. http://www.usatoday.com/news/nation/2005-07-01-la-mayorswornin_x.htm. Retrieved 2009-06-05. Patrick McGreevy (2006-02-17). "Katrina Debacle Prompts L.A. to Prepare for Disasters, Attacks". Los Angeles Times. http://articles.latimes.com/2006/feb/17/local/me-terror17. Retrieved 2009-06-06. Sentinel News Service (2009-03-09). "Villaraigosa, Bratton Expand Largest LAPD Officer Deployment in City History". New American Media. Los Angeles Sentinel. http://news.newamericamedia.org/news/view_article.html?article_id=78b35fce1274c1aa4dcf72fc2ebd30e3. Retrieved 2009-06-06. Steve Lopez (2006-02-04). "97% In Poll Want Villaraigosa To Debate, But He Still Refuses". Los Angeles Times. http://www.latimes.com/news/columnists/la-me-lopez4-2009feb04,0,4848601.column. Retrieved 2009-02-04. Katy Dhanens (2006-02-18). "Mayor Villaraigosas Campaign Not Up For Debate". The Occidental Weekly. http://media.www.oxyweekly.com/media/storage/paper1200/news/2009/02/18/News/Mayor.Villaraigosas.Campaign.Not.Up.For.Debate-3634823.shtml. Retrieved 2009-02-18. Phil Jennerjahn (2006-06-03). "Recalling Villaraigosa". Mayor Sam's Sister City. http://mayorsam.blogspot.com/2009/06/recalling-villaraigosa.html. Retrieved 2009-06-03. Alternative names Villar, Antonio Ramon, Jr.
Place of birth Boyle Heights, Los Angeles, California, U.S. This page was last modified on 23 February 2011 at 04:04.